1. 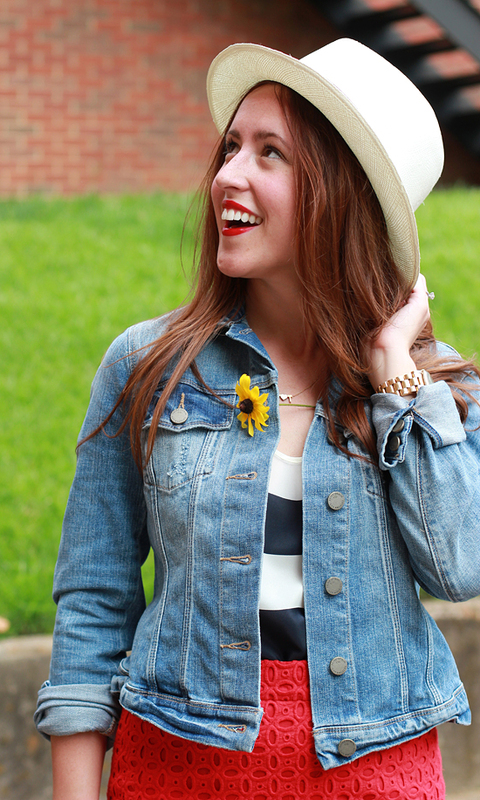 I am officially obsessed with this Panama hat... prepare yourself to see it. A LOT. 2. Summer has arrived in Nashville, the humidity, the 80 ˚F nights, the lightning bugs, the mosquito bugs.. it is all here! 3. I don't know how I got dressed before meeting the lovely ladies of the Southern Blog Society. Thankfully if you are looking for jean jacket styling tips, there are 9 beautiful bloggers showing you their unique take on it today! Seriously, blogging is so much more fun with friends! If you are looking to make a jean jacket your own, consider these fabulous hand-picked options by moi! 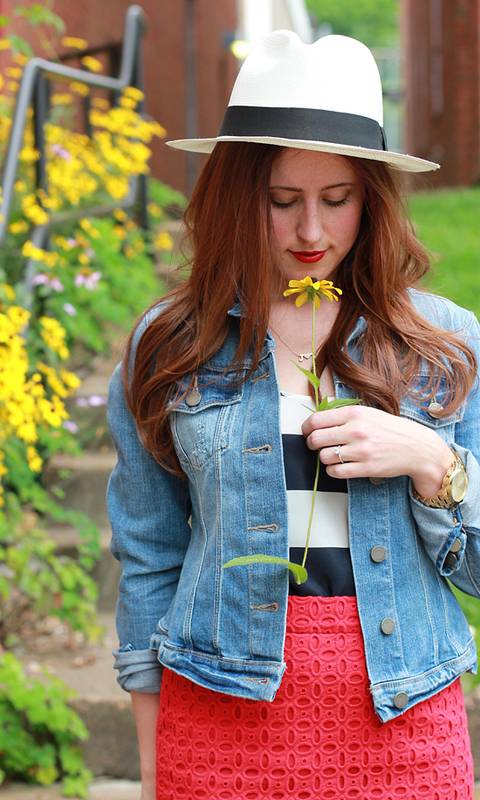 I love the nautical vibe of this outfit...and you know I can't resist a great hat! I am so jealous of your never-ending swag bag! Loving this outfit! 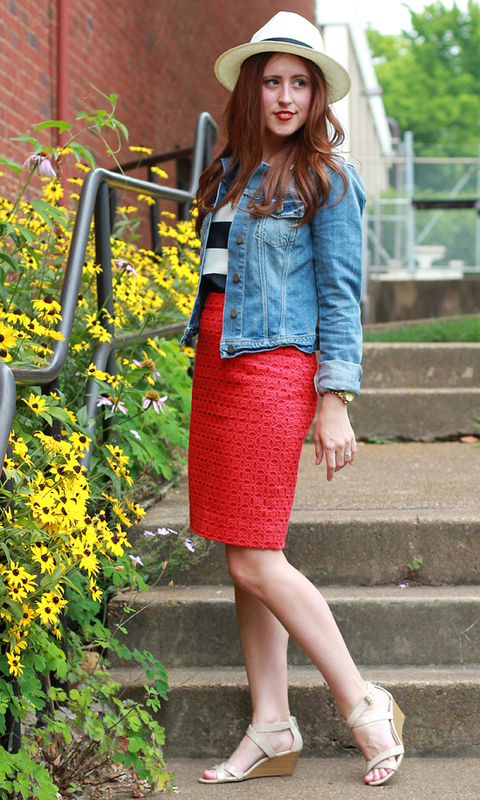 That skirt is adorable and I love how you styled it with the jacket! I wish I could rock a panama hat, I just can't for some reason! Looks great on you! This hat is adorable on you! And I'm seriously jealous of that swag bag–you got so many good things! This is seriously cute! 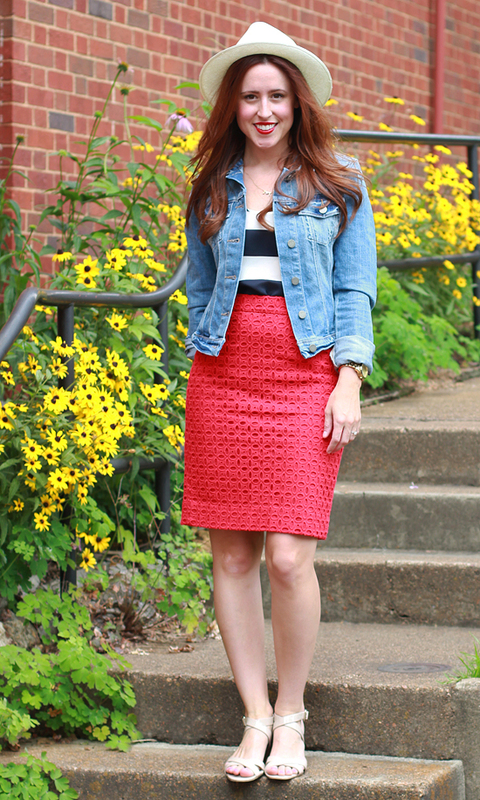 Loving that eyelet pencil on you!! Love you in this Panama hat! I have one just like it! I need to wear it more! You rock that hat like nobodys business! Guuurl. So adorable. I totally saw you in all the SBS pics and you looked lovely! You are just the most adorable ever! I love that skirt and that hat! I was eyeing that hat last night! Love it! SO cute! Love your panama hat with your jacket and pencil skirt! The perfect put together yet casual outfit! Lookin' good lady! And are you still taking your own photos with a tripod and clicker?! If so I'm super impressed! Your photos are amazing! Just added three new blogs to my Feedly because of this post, thanks!! Love your outfit btw! SO cute! I love your hat and the red skirt is amazing! I'm obsessed with my Denim jacket that I purchased from Gap years ago. It is perfectly broken in and has a few tears that give it character. Everyone should have a denim jacket. Yay that makes me happy! These ladies are pretty fab! Just me, my tripod & a remote, hanging out in Nashville alleyways, avoiding people I might know. Thanks lady, not going to lie, it is A TON of work taking my own pictures, but when they turn out decent, it is pretty gratifying all around! I don't think I have taken it off since I got it a couple weeks back.... LOVE it! Um, YEA we got completely SPOILED! My first ever swag bag and I'm pretty sure it ruined me for all potential future swag! I don't believe that for a second little missy! yea, sorry... it was awesome. I am still pulling stuff out of it! I wish I could say that all the swag prevented me from excessively shopping this month... whoops! Well you're doing a FAB job! All your photos look great! I still need to know about everything in that swag bag!! :) And the mosquitoes are terrible here as well. I'm positive I have at least 8 bites on me...is that ridiculous or what?!? This outfit is perfection, Jess! your hat is white or natural color? i want to buy one but can't make up my mind which one looks better. you re rocking that hat.